The much-loved actress had been making a slow recovery after falling ill in October, but her condition deteriorated and she died peacefully in her sleep at the Salford Royal Hospital on the 2nd of December. Coronation Street Executive Producer Kieran Roberts said: “Maggie was a much-loved colleague and a wonderful actress who turned Blanche into a true Coronation Street icon. She will be hugely missed by Coronation Street’s many millions of viewers and by everyone who works on Coronation Street". Maggie appeared in more than 830 episodes of Coronation Street and her barbed one-line comments made her one of the best-loved soap characters of all time. 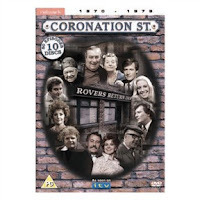 For a selection of Coronation Street classic episodes visit www.24studio.co.uk. You'll find dvd boxsets from the 60s, 70s and 80s containing 10 dvds from £49.99.